A blood clot in the leg or ‘deep venous thrombosis’ (DVT for short) is one of the more common complications that can occur following hip or knee replacement surgery. Without any precautions taken, DVT develops in up to 70% of patients having knee surgery and 50% of those having hip surgery. A smaller percentage of these patients may develop the more serious complication of pulmonary embolus, where a fragment of blood clot floats up to the lungs. For many years we have been getting better at preventing DVT in hospital by using a number of measures including medication. We know, however, that the risk of developing DVT remains increased for several weeks after surgery and it is therefore desirable to continue these measures even after discharge from the hospital. One of the most effective measures is a medication called Low Molecular Weight Heparin (LMWH), which is given by injection under the skin with a fine needle, in the same way that diabetics use insulin. This is given daily in hospital by the nursing staff. Until now, the medication had to be ceased when the patient was discharged from hospital. Now, however, a program has been developed to teach patients how to give their own injections. 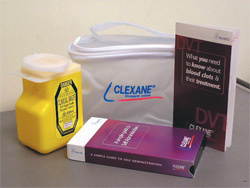 When discharged, they are provided with a kit with everything they need, including pre-packed syringes to enable them to continue taking this preventative medicine for a total of three (3) weeks: extended DVT prophylaxis. With a bit of practice, extended DVT prophylaxis is safe and easy. This way, your risk of developing this potentially serious complication can be reduced even further.